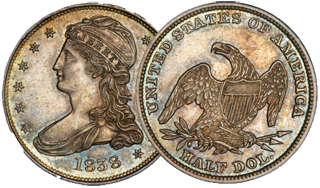 The Draped Bust Half Dollar coin was struck between the years 1796 and 1807 with two different obverses. The first obverse, issued from 1796 to 1797, feature a small eagle and is considered one of the most desirable coins in all of American numismatics due to its rarity. The second obverse, issued from 1801 to 1807, feature the heraldic eagle and is more common today due to higher mintages.